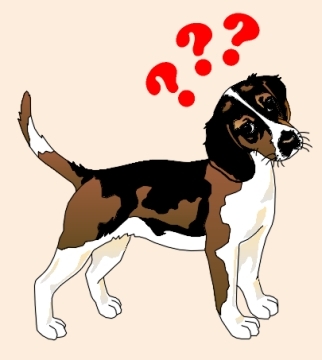 A few days ago we asked if you could name five dog breeds which primarily only came in red, black, black & tan, or white. If you haven’t checked out our recent post, please visit it before reading the answers below. Vizsla – Solid golden rust. Nova Scotia Duck Tolling Retriever – Any shade of red usually with white markings. Redbone Coonhound – Red with dark muzzle and small amount of white permissible. Irish Setter – Mahogany or rich chestnut red. Irish Terrier – Red, golden red, red wheaten, or wheaten. Finnish Spitz – Shades of golden red. You could almost name the Irish Red & White Setter which is white with solid red patches. Or even the Pharaoh Hound could be included. His colors are defined as tan or chestnut which is a reddish color albeit not as reddish as the ones listed above. Black Russian Terrier – Solid black or black with a few gray hairs. Giant Schnauzer – Solid black or pepper and salt. I couldn’t think of five dog breeds which only came in black. But since we included red with white above, can that mean that we can include black and white here? So perhaps include the Dalmatian in this list. Perhaps the Newfoundland but he can also be brown or gray. Or the Flat-Coated or Curly-Coated Retriever which can be solid black or liver? Gordon Setter – Black and tan. Black & Tan Coonhound – Black and tan. Airedale Terrier – Tan with black or grizzled saddle. Rottweiler – Black and tan. Manchester Terrier – Black and tan. Beauceron – Black and tan or black with gray and tan. We could almost name the Doberman Pinscher but he also comes in red and tan or blue and tan. 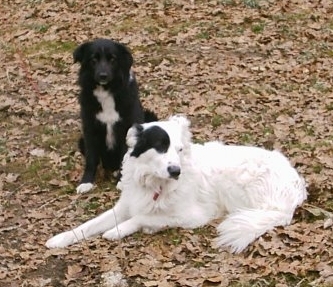 Great Pyrenees – White but can have small markings of gray or tan. Samoyed – White, white and biscuit, cream, or all biscuit. Sealyham Terrier – White but may have lemon or tan markings. West Highland White Terrier – White. American Eskimo Dog – White or white with biscuit cream. Bichon Frise – White, may have cream shadings. I have named as many as we could. This is not, by any means, a definitive answer. There may be a dog breed that I have missed. And I have to admit that I cheated by looking through “The Dog Breed Bible“. What did you find? Do you know which AKC dog breeds primarily come in one color? See if you can list five dog breeds in each of the following categories. Reddish – Name five reddish dog breeds. The red may have some white but no other color. 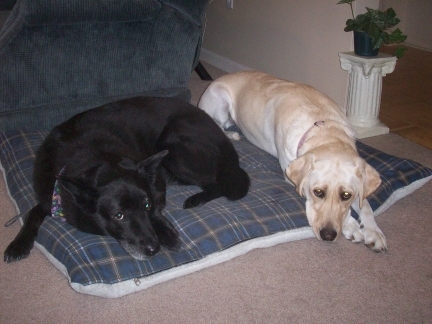 Black – Name five solid black dog breeds. The black may have gray or salt & pepper. Black & Tan – Name five black and tan dog breeds. Remember, only list dog breeds which only come in black and tan and not any other color. White – Name five white dog breeds. The white may include some small and light-colored markings or be an off-white color such as cream. This is a challenge. I don’t think I named five in each category so I may have made a few exceptions on the rules. I will post my answers on February 28th. Let’s see what you can find! My love for dogs came from my mother. We always had at least one dog in our household while growing up. And they weren’t dogs who lived outside. They were inside dogs and they were family. My mom didn’t care whether a dog was a mutt or a purebred. It didn’t matter if they came with issues. She loved them all the same. Animal rescue groups were virtually unheard of at this time – at least in the area that we lived. The only place for stray dogs was the pound where animals were put to sleep daily. My mom could never let that happen. Whenever she found a stray dog, she took it in and tried to give them a good home. Sometimes we kept the dog for our family and sometimes we didn’t. I remember having at least six dogs at one time, but my mom says there were times when we had more. My mom was a very social person and so a lot of people knew her well and knew her for a dog lover. So whenever someone in town needed to find a new home for their dog, or if they found a stray, or if they were looking to get a new dog for their family, my mom’s friends would direct these people to her. When my mom gave some of the dogs away, she did not have them fixed or get them their shots like todays rescue groups would. But she didn’t charge them either. The dogs were free to a good home. And yes, my mom did what she could to make sure the dogs were given to good homes. There was no application process but my mom said no to certain people. We have had so many dogs come through our household so there is no way I could tell you about them all. But here are a few special ones. There was Lady, a black Labrador that my mom found while out deer hunting. My mom put an ad in the paper and put up signs in the area but no one ever claimed Lady so we kept her. There was an Afghan Hound that someone had given up. The dog had been an outside dog so my mom worked with her to make her more social and to potty train her before finding her a good home. There was the Mastiff and/or Pit Bull mix named Squash. He belonged to our neighbor who left him outside on a short and thick chain 24 hours a day. When they moved, they left Squash behind. My mom took him in, potty trained him, and made him a great family pet. There was also my beloved Cassie who was a Shetland Sheepdog. Her owners gave her up and she became my dog. And there was a German Shorthaired Pointer named Frog Lips who was given up because his owner was in bad health. The owner who had to give him said that he had found this dog on the side of a road with an ax in his head and his eye gouged out. Frog Lips lived a good many years with his rescuer before his rescuer got sick. And we had him for a few years more. My mom never got rid of a dog because of their issues. If a dog had too many issues to just give away, my mom generally kept them. Frog Lips was a good example. He had severe separation anxiety and tore up a lot of stuff over the years. So it was from my mom that I learned to love dogs and to treat them like family. Although I don’t rescue dogs like she does, I have been known to take in strays and keep my dogs for life. Do you have a dog hero in your life? Where did you learn your love for dogs? We’d love to hear your story! My new dog Pierson is nothing like my dog Maya when it comes to sociability. As a Labrador Retriever, Maya loves EVERYBODY. And as a dog breed with a gun dog heritage, loud noises don’t faze her. Pierson, my Border Collie/Aussie mix is a different story. After Pierson’s first week in his new home, it became obvious that I was going to have to work on socializing my new dog. Pierson does not like loud noises or fast movements. He has gotten more comfortable when this occurs in our home, but he completely freaks out when it happens outside our home. And he is scared of our roommates. Even though he sees them every day and they give him treats, he sometimes gets inexplicably scared and barks at them. During walks, I am pulled in one direction by Maya trying to greet people passing by while Pierson is pulling the other direction trying to get away. Pierson is very wary of visiting guests and even growled at someone who brought their little baby. Pierson will not go inside public places like the pet store without much coaxing. In the beginning, I had to pick him up and carry him in. At one of the shops we visited, Pierson barked at a 12 year old girl. While socializing my new dog, he is exposed to all sorts of outside noises when we go for our walks. No lawnmowers yet since it is winter, but bicycles, cars, motorcycles, and kids playing. Whenever a noise startles him, I keep walking as if nothing is wrong. Inside, he has been introduced to the vacuum, kitchen sounds, and tv sounds. Pierson no longer has any problem with kitchen noises or the tv. He has learned noises in the kitchen are a good thing since we sometimes drop food on the floor or get his treats from there. He still doesn’t like the vacuum cleaner but he doesn’t run and hide like he did the first time. To get him used to this sound, I give him a bone to chew on while I vacuum. He only gets the bone at that time. I am hoping he will learn to associate the vacuum with food like he does for the kitchen noises. We occasionally have visitors to our home. I tell them not to try to pet Pierson until after he has had a chance to sniff them over on his own. In fact, they should completely ignore him for the first few minutes. Don’t look him in the eyes for more than a second. If when we go out in public and someone asks to pet him, I tell them they have to wait until he sniffs them. And I suggest that it is probably easier to try to scratch him on his chest than to pet him on the head. Socializing my new dog in winter is a bit more difficult in winter. We haven’t gone to the park yet, and even if we did it is not likely that there will be many people there anyway. So I have to be a bit more creative. We have been to Petco, Pawsh Wash, and a pet consignment shop called The Dog House. On the first and second visits, I had to carry him in. But now he is beginning to trust me and tries to stay close to my side whenever we go in. Whenever he first goes into a building, I stop and let him look and sniff around (while on a leash of course). I let him lead the way so that he can see there is nothing to be afraid of. Once his walk seems a bit more relaxed, I take him to where I want to go. I don’t have much to say on this one because Pierson has adapted to the car quite well. He is even used to his dog car harness, although I have to be careful that he doesn’t try to chew it. Even if Pierson is scared of the places we go, he is not frightened of the car. He does sometimes get car sick, but he will jump into the car like it is the place to be. If I am going to any place with a drive-though, like the bank or fast food place, I try to take Pierson with me so that he gets even more used to it. As with dealing with Pierson’s separation anxiety (see previous post), I do not make a big deal out of anything. If he is scared of something, I act like there is nothing wrong. I don’t sooth him or act in any way like I am trying to protect him. If there is something or someone that I think would present a hazard, such as a leash-aggressive dog, I will walk Pierson away from it/them without a fuss. I once made the mistake of introducing Pierson to too much at one time. There was an event with lots of people and other dogs that I took him to. He was terribly frightened and so we had to leave after a short time. I learned that while socializing my new dog, I had to take it slow. I don’t want to overwhelm Pierson. I want to do a little at a time to build his confidence. If you have any other tips for socializing my new dog, please feel free to leave a comment. Pierson is already a great dog, but it would be nice if I could take him places and share him with others without stressing him out. My dogs get along great. Sephi and Maya weren’t that close, but they got along okay. Their relationship was like sisters in that Sephi was the bossy older sister and Maya was the tag-along. Maya and Pierson’s relationship, however, is much closer. They are the perfect playmates. Both love to play and so both play all the time. It is fun watching them wrestle and they make me laugh when they steal each other’s toys. Sometimes they snuggle together, but not often because Pierson tends to get too hot too easily. 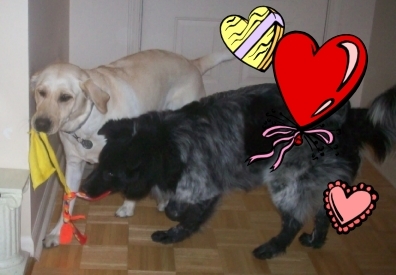 Be sure to tell us about your pets this Valentine’s Day! As you may know from previous posts, I have a new dog. 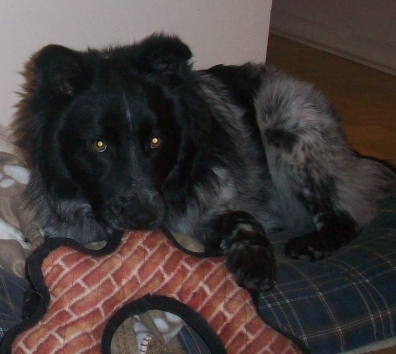 Pierson is a Border Collie and/or Australian Shepherd mix who was rescued from a park where he had been living as a stray. He has fit very well into our home, but as the days go by we are seeing some problems develop. One of those issues in my dog is separation anxiety. 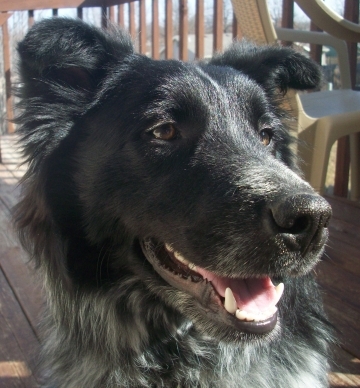 From what I understand about the Border Collie or Australian Shepherd is that because these dog breeds have such a close affinity with their owner, they tend to get distressed when they are away from them for any length of time. Since I work at home, I am around my dog all the time. So obviously my dog has drawn close to me. And now, whenever I leave, I hear him whine desperately after I shut the door. Now that I have observed this separation anxiety issue, I need to address it. But how? Separation anxiety is not always easy to fix. Right now, all he does is whine. But it could get worse. His anxiety could lead to destructive behavior. It could even lead to health problems. The best thing I can do is try to head it off before it gets any worse. And by doing that, I can help my dog eventually overcome his separation anxiety issues. Now that I know Pierson has separation anxiety, I need to practice leaving him at home alone more often. Since I am home most of the time, this is actually rather easy. All I have to do is go outside for a few moments, then come back in. Sometimes I go to run errands which means I am gone longer than a few minutes. By varying the time that I am gone, I am hoping to help him understand two things: 1) Although I am leaving, I am coming back, and 2) I could only be gone a short time so no need to worry. With Sephi and Maya, I would pet them for a few moments before I left. Since they didn’t have any separation anxiety issues, this was not a big deal for them. But it seems that it could be a big deal for Pierson. So now whenever I leave, I do it quietly. No hugs, no kisses, and no petting. I just leave my dogs and ignore them if they follow me to the door. By leaving quietly, I am showing my dog Pierson that me leaving is not a big deal. Whenever I come home, I completely ignore my dogs for the first few minutes. Although I used to enjoy coming home and having my dogs jump all over me excitedly, I know that by reacting to it I am encouraging the separation anxiety. By ignoring my dogs for a short time, I am showing them that there is no major difference between me being home and me not being home. This is my first experience with having a dog with separation anxiety issues. As of this date, I have only had my dog Pierson one month and one day. Only time, patience, and consistency will tell if I am able to head off my dog’s separation anxiety. If you have any additional tips, please share them with me. I’d really like to prevent my dog from developing severe separation anxiety.